Going to the game with a hangover is never a good idea, but given our current form it borders on the masochistic. It’s even worse when you ignore your Liver’s pleas for mercy and agree to meet in a pub for a pre match beer. ‘Get a pint down you quick and you’ll be sound.’ That’s probably not the best medical advice I’ve ever received, but as it happened it worked. I had decided to walk, hoping the fresh air would clear my throbbing head. That idea didn’t really work and by the time I reached the pub, I am told I was a weird shade of grey and had a serious case of the beer sweats. This wasn’t a good start. The perfect metaphor for our season. The mood was flat and it seemed few could see Liverpool managing to get much from the game. The smattering of Villa fans dotted around the ‘Flat Iron’ seemed happy enough. Why shouldn’t they be? After all Anfield has been a happy hunting ground for them of late. Yes we’d robbed them of their main threat, signing Benteke in the summer, but this is a Liverpool side that only strikes fear into….well Liverpool fans. They must have fancied three points and who could blame them. On the telly Spurs and City were busy proving what a crazy season this was already proving to be. It was a point that Chelsea would reinforce at St James’ Park later in the day. This is surely the only crumb of comfort in a start that has sent most of us crashing into the depths of depression. Any team that can put together a decent run of results could find themselves, no matter how undeserved, sitting at the summit. Yet still none of those crowded into that alehouse at 2pm could see Liverpool actually managing that. There is an air of fatalism surrounding the club at the moment. Few of us could see Rodgers surviving until Christmas and even after the game the feeling persists. I played “he’s lost the plot” and “we don’t look like we’ve got a clue” bingo as I supped my pint and prayed for the waves of nausea to subside. At least my headache was subsiding. Then a small group of Villa fans decided to ramp up the cringe-ometer. I would have rolled my eyes skyward in the old days, filled with a sense of superiority and certainty that we would never indulge in such nonsense. Then it occurred to me that, although I am yet to see a palm tree at Anfield, it’s probably only a matter of time. Liverpool as a club are on the brink of becoming ordinary. There is evidence all around, from the ambitions of the boardroom to the chants of ‘who are ya?’ and the boos on The Kop. We are slowly losing any right to look down our noses at other clubs and their fans. All may not be lost yet, but it’s a depressing trend. It was approaching match-time so we downed our pints and followed the palm tree and it’s band of merry ‘Villans’ into the September sun. We separated outside The Kop and agreed to meet up again afterwards for a couple, regardless of the score. As I took my seat I was buoyed by news that Sturridge and Ings would start up-front. At least I hoped that would be the case and Ings wouldn’t be pushed wide, leaving Sturridge isolated. There was more talk about must-wins and ‘he’ll be gone if we lose this’ and then the game got under way. When you’re completely bereft of confidence the last thing you need is a tense nervy start, in which the opposition can build patiently and put you under pressure. Fortunately for us James Milner had decided we wouldn’t be having any of that. I’d barely sat down and the ball was nestling in the bottom corner of the Anfield Road goal. “Did you see who got it?” “Milner – Get in!” It was exactly what we needed and hopefully we would build on it. Villa are poor and should have been the perfect ‘sacrificial lambs’. If only. Liverpool looked better and were clearly benefiting from two up top. Milner and Lucas were also having a good game, but it was at the back where things were still not right. The back three doesn’t seem to be working and it’s even harder to understand why Can should be anywhere near it. He struggled all game in that position and you just can’t help but feel his obvious talent is being wasted there. Of course we couldn’t get through the half without a trademark goalmouth flap from Mignolet. Just before half-time he elected to punch an Alan Hutton cross rather than save. As usual it was followed by some defensive chaos, but fortunately Westwood shot wide when he looked certain to score. It drew anger and frustration from The Kop, but fortunately no boos. The crowd had been in good form first half and it was a welcome reprieve from the bad tempered atmosphere of mid-week. Half-time came and it was a case of so-far-so-good. Villa were appalling. They looked clueless and completely lacking in ambition. Yet they had still managed to fashion a couple of chances. We needed a second and early on, if we were going to avoid more frustration. As the second-half got under way the signs were good. Milner was at it again and drew a decent save from Guzan with the half barely ten minutes old. Then Coutinho followed up with a free kick that was a bit too easy for the keeper. The noise level was good and I sensed a breakthrough was coming. 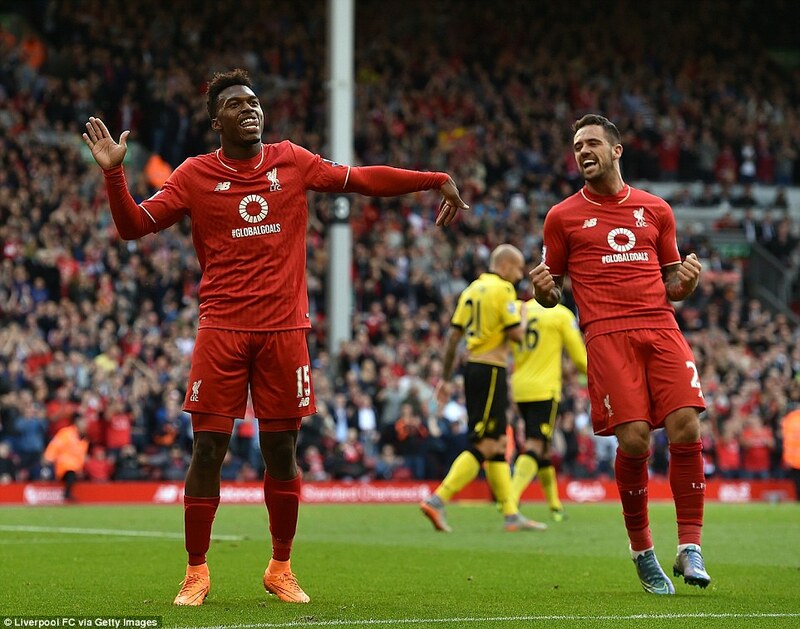 Then Sturridge spectacularly obliged. 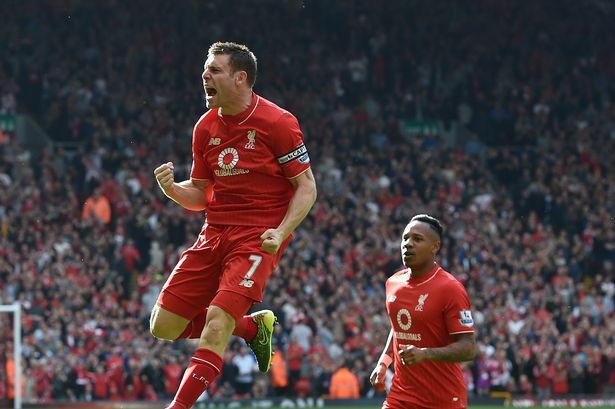 He played a great one-two with Milner and dispatched a superb volley into the far corner. The Kop erupted and, as the pandemonium died down, I saw him doing his dance with a big beaming smile on his face. My seat under the scoreboard gives me a view of the hospitality lounges in the Centenary Stands. Clearly Daniel’s family were in one of them and jubilant celebrations broke out, which the player acknowledged from the pitch. He had clearly needed that and he will have enjoyed hearing The Kop sing his name once again. It’s been a rough ride for the forward, but he proved exactly what we had been missing with that finish. I admit my immediate thought was get him off. Sturridge is now so crucial to our season, any injury would spell disaster. Fortunately Rodgers had other ideas. Luckily the striker would see out most of the game, because Liverpool’s defence would ensure that we need his heroics once again. At two-nil the game should have been over. Villa had offered little and surely they had a mountain to climb now. From that point on the best they could have hoped for should have been damage limitation. A better side would have destroyed them; they were that bad. This is Liverpool though and as recoveries go this is a very fragile one. This was a point Villa would hammer home on 66 minutes. To be fair The Red’s defence can claim the assist. Alan Hutton easily beat his man down the right and crossed for Gestede to score as the back three appeared to say “after you sir”. I have no idea why Mamadou Sakho punched the floor repeatedly, but his obvious anger was mirrored in the stands. This is the Liverpool we have come to know and loathe; self destructive and calamitous. The difference yesterday though was Sturridge. Villa fans had no sooner finished celebrating when he popped up again to restore our two goal cushion. Another delightful one-two, this time with Phillipe Coutinho. El Magico delivered a delightful back-heel into his team-mate’s path and the striker dutifully dispatched it low into the far corner. Cue more scenes of delirium, only this time as they settled down it wasn’t a jubilant Sturridge that caught my eye. To my right and in the Centenary Stand I notice a fan in a Henderson shirt holding up a sign. It was a home made job and wrapped in a plastic sleeve. This ‘supporter’ had obviously waited for his moment and confident he stood a chance of getting on the telly, with the cameras on the celebrating Red’s players he held his ‘work of art aloft’. I could clearly see that he had printed “Suarez made you Brendan – #RodgersOut”. It astounds me that any Liverpool fan would smuggle something so embarrassing into the ground, let alone hold it up when we have just scored. At that moment I was growing genuinely nostalgic for the inflatable palm tree. The Kop burst into a rendition of ‘poetry in motion’ and for a brief moment I was transported back to happier times. It was to prove very short lived. Just four minutes later Amavi delivered an inch perfect cross into The Reds box and once again completely unchallenged Gestede planted the ball in the back of the net. 3-2 and a nervy finale beckoned. 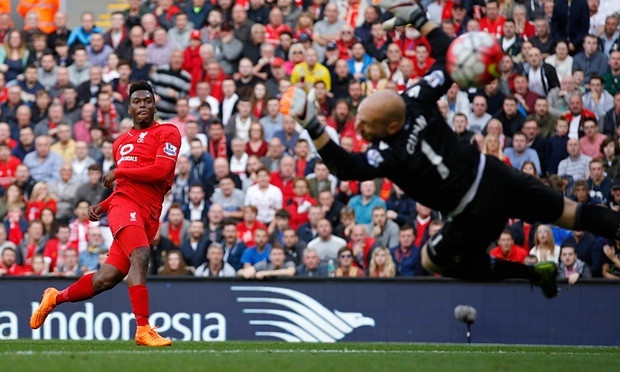 Villa, a team completely lacking in ambition had somehow managed two score twice at Anfield. My hangover was beginning to resurface and I was looking at another weekend of avoiding the papers. Liverpool didn’t retreat though and to be fair they kept pushing forward. 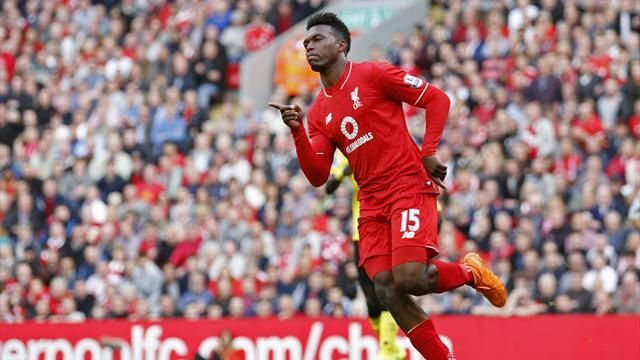 Sturridge repeatedly squandered chances for his hat-trick. He was clearly tiring and you could see he wouldn’t finish the game. There was more frustration as Coutinho’s brilliant free-kick was saved by Guzan, but Liverpool held on for the three points. As the whistle went a loud roar of approval went up, as much in relief as anything else. For Brendan this represented temporary shelter from the storm. However, a better team would have beaten Liverpool yesterday. If this is to become a permanent reprieve for the boss, he will need to keep Sturridge fit and plug the holes in our defence. Mind you a prolific striker and a leaky back-line – wasn’t that the ‘hair of the dog’ that bit us in 2013-14.